Ha Norse nga mitolohiya, an Ragnarök in sagunson nga mga panhitabo ha panahon nga maabot, nga naglalakip in dako nga pag-aragway nga gintigo nga mangangadto han pagkamatay hin pipira nga makagarahom nga mga diyosdiyos (sugad kanda Odin, Thor, Týr, Freyr, Heimdallr, ngan Loki), nga panhihitabo hin durudilain nga mga disastre natural, ngan masunod nga pagkalunod han kalibutan ha tubig. Bailey, Richard N. (2002). "Scandinavian Myth on Viking-period Stone Sculpture in England". In Barnes, Geraldine; Ross, Margaret Clunies. 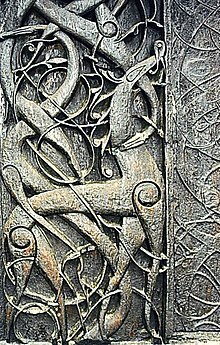 Old Norse Myths, Literature, and Society. Sydney: University of Sydney. ISBN 1-86487-316-7. http://www.arts.usyd.edu.au/departs/medieval/saga/pdf/015-bailey.pdf. Dronke, Ursula (1997). The Poetic Edda: Volume II: Mythological Poems. Oxford University Press. ISBN 0-19-811181-9. Fazio, Michael W.; Moffett, Marian; Wodehouse, Lawrence (2003). A World History of Architecture. McGraw-Hill Professional. ISBN 0-07-141751-6. http://books.google.com/books?id=HrzPlqLjR1MC. Bernharðsson, Haraldur (2007). "Old Icelandic Ragnarök and Ragnarökkr". In Nussbaum, Alan J.. Verba Docenti. pp. 25–38. ISBN 0-9747927-3-X. Hopkins, Joseph S. (2014). "The 'Viking Apocalypse' of 22nd February 2014: An Analysis of the Jorvik Viking Center's Ragnarök and Its Media Reception". RMN Newsletter (University of Helsinki) 8: 7–12. ISSN 2324-0636. Hunter, John; Ralston, Ian (1999). The Archaeology of Britain: An Introduction from the Upper Palaeolithic to the Industrial Revolution. Routledge. ISBN 978-0-415-13588-7. http://books.google.com/books?id=Fiw99ueTkU0C. Larrington, Carolyne (1999). The Poetic Edda. Oxford World's Classics. ISBN 0-19-283946-2. Lindow, John (2001). Norse Mythology: A Guide to Gods, Heroes, Rituals, and Beliefs. Oxford University Press. ISBN 0-19-515382-0. http://books.google.com/books?id=KlT7tv3eMSwC. MacLeod, Mindy; Mees, Bernard (2006). Runic Amulets and Magic Objects. Boydell Press. ISBN 1-84383-205-4. http://books.google.com/books?id=hx7UigqsTKoC. Phillpotts, Bertha (1905). "Surt". Arkiv för Nordisk Filologi 21: 14 ff. Pluskowski, Aleks (2004). "Apocalyptic Monsters: Animal Inspirations for the Iconography of Medieval Northern Devourers". In Bildhauer, Bettina; Mills, Robert. The Monstrous Middle Ages. University of Toronto Press. ISBN 0-8020-8667-5. http://books.google.com/books?id=5M7JElJtK8AC. Schapiro, Meyer (1942). "'Cain's Jaw-Bone that Did the First Murder'". The Art Bulletin 24 (3): 205–212. JSTOR 3046829. doi:10.2307/3046829. Ini nga pakli kataposan nga ginliwat dida han 20:22, 16 Pebrero 2015.